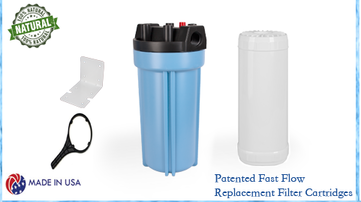 CuZn water filters provide pure, delicious water by removing more than 600 contaminants from your water source including chlorine, lead, heavy metals, trihalomethanes (THM’s), disinfectant by products (DPBs), sulfur, iron, hydrogen sulfide, herbicides, pesticides and many types of pharmaceutical drugs, all without removing essential minerals All CuZn components and media are NSF certified. Additionally, CuZn's patented filtration media provides salt-free softening of your water – NOTE: If you have 8 grains of hardness or more, consider a high-hardness model – and removes and prevents scale buildup. Unlike traditional salt based water softeners, CuZn systems won’t make your water feel slimy, have hair flattening effects, strip beneficial minerals or add salt to your water.